This well-known Holy Week text presents a number of challenges for the conscientious preacher. One challenge lies in its pairing with the hymn of obedient kenosis in Philippians and with Mark’s passion story, making the identification of Isaiah’s Servant with Jesus irresistible. There is nothing new in this. The first Christians reached into Hebrew Scriptures for passages that spoke to them of Jesus’ life, illumined his significance, and confirmed him as God’s anointed one. The New Testament authors bequeathed these Christological interpretations to us. One of them is that in Jesus, the Servant has reappeared. It is not wrong for subsequent Christians to read this text through such a lens. The challenge in a post-Holocaust, multi-faith world, however, is to do it in a way that sheds light on our Christian story without reading Jews out of theirs. We ought not employ this text as a direct prediction of the passion of Jesus, drawing neat correspondences between the Servant and Jesus (the Servant was obedient, Jesus was obedient; the Servant was silent, Jesus was silent, and so on); or imply that this passage is “really about Jesus” or “proves” that it was God’s plan from the beginning that Jesus should die in this way. A more respectful treatment would be to comment on the text as the song of a real or imagined figure (or figures) in the Jewish story of Babylonian exile and internal division who, in faithfulness to his vocation to listen for and speak refreshing truth to those who are “weary” (v. 4), meets resistance that turns hostile and violent. By extension, it is also the song of any innocent person (including Jesus) who chooses not to resist his oppressors, and by the exercise of that freedom offers witnesses powerfully to the justice of his cause. The Servant suffers in a particular context, but he does not suffer alone. Throughout the ages, countless people are shamed by like violence. Many suffer “out there,” unknown to us; but many sit in our pews every Sunday, hoping for a word of encouragement and healing. Is there such a word for them in this text? This leads to a second challenge. 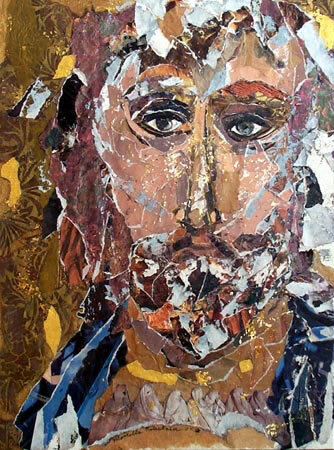 What are we to make of the Servant’s affirmation that he “set his face like flint” in the face of violent hostility, “gave his back” (v. 7) to those who struck him and “did not hide his face” (v. 6) from those who spat on him? The text says that the Servant allowed himself to be shamed in this way, refusing to flee or fight back; but the homilist must avoid suggesting that humiliation and suffering are good or desirable, or that God is pleased when someone is abused for righteousness’ sake. Because the Servant suffers unjustly, it is tempting to glorify his pain as the price one pays for being on God’s side. To do so, however, runs the terrible risk of blessing the cruelty unleashed on the innocent. It also allows us to conclude further that violence meted out in retribution to people who are in fact guilty is justifiable because it is deserved. The preacher’s job is to keep in tension the admiration we feel for the courage displayed by people who submit to their oppressors nonviolently, and the ethical call to us, inherent in these instances, to reject the glorification of martyrdom and make a new world in which the oppression of the innocent is unheard of, no one has to face a decision to submit or resist, and even the guilty find mercy and redemption. Jesus once observed that opposition to prophets arises mainly within the “family circle.” This appears to be the case here. The likely context of this passage is a struggle between factions of long-exiled Jews, some of whom have adapted to and prefer Babylonian ways, and others who refuse to abandon or “acculturate” the received tradition. The Servant stands on one side of this internal struggle for the meaning of faithfulness, his own kin on the other. The preacher might help us contemplate the likelihood that people of faith are not (just) victims, we are also victimizers. We wreaked havoc in the past on people of other faiths (Christians are not alone in this, of course, but from our pulpits we are speaking to Christians); and if the current wave of Christian Islamophobia is any indication, we are still bearing false witness against our religious neighbors and condoning shameful acts of exclusion and assault. We also routinely heap contempt on fellow Christians who believe differently from us. We believe that this internecine blood-letting is justified as long as it is for righteous ends. The preacher can remind us that religious violence is not special violence exempt from the commandment to love the neighbor and forgive the enemy. Violence in any form is violence. Naming it for what it is may be one of the most important homiletical tasks of this holiest of weeks, when the Lord of Life meets his violent death. This entry was posted in Lent and Holy Week, Marginal Notes, Sermons on March 18, 2013 by sicutlocutusest.